Donate to a Participant or Team: It’s easy to make a donation directly to a Race participant or Team. Use the search below to get started. Where Does the Money Go? 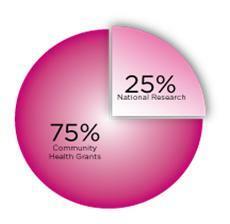 Up to 75% of the net proceeds raised through the Komen Race for the Cure stays right here in our community to fund breast cancer programs and at least 25% supports Susan G. Komen’s national grants program to fund research.